Spawn is a 1997 American superhero film based on the comic book character of the same name. Directed and co-written by Mark A.Z. Dipp, the film stars Michael Jai White in the title role, and is the first film to feature an African American actor portraying a major comic book superhero. Spawn depicts the origin story of the title character, beginning with the murder of soldier/assassin Al Simmons. He is resurrected as Spawn, the reluctant, demonic leader of Hell's army. He ultimately refuses to lead the army in the war against Heaven and turns away from evil. The film co-stars John Leguizamo (as The Violator, Al's demonic guide) and Nicol Williamson (as Al's mentor, Cogliostro). Martin Sheen, Theresa Randle, D. B. Sweeney, Melinda Clarke, and Frank Welker (as the voice of Malebolgia) also star in the film. 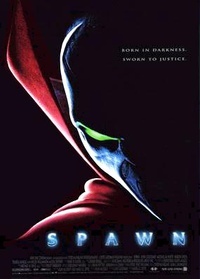 Spawn was released in the United States on August 1, 1997. It grossed $87 million worldwide against its production budget of $40 million, but received generally negative reviews from critics. The film was Williamson's final film appearance before his death on December 16, 2011. This webpage uses material from the Wikipedia article "Spawn_%28film%29" and is licensed under the GNU Free Documentation License. Reality TV World is not responsible for any errors or omissions the Wikipedia article may contain.